Alugbati is also known as basella, Malabar spinach, Indian spinach or vine spinach. It has dark green leaves similar to regular spinach but with green-purple stems. It grows in a vining rather than bush pattern and has a slightly more fibrous texture than regular spinach. 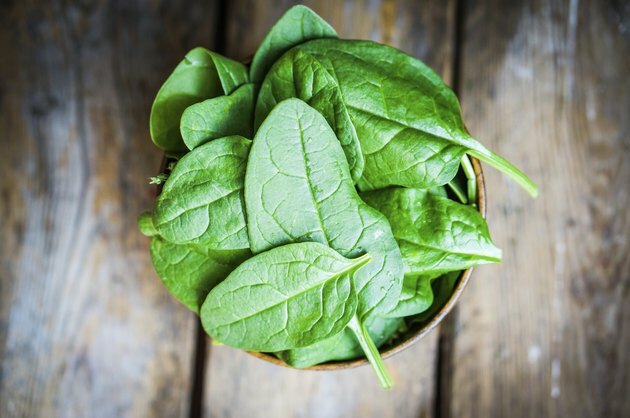 It can be cooked in the same way and, like spinach, is a good source of a number of essential nutrients, including iron. A 1 1/2-cup serving of cooked alugbati has only 15 calories per serving, around a half gram of fat and 1.4 grams of dietary fiber. It also has 75 micrograms of folate, or folic acid, per serving. This provides 12.5 percent to 19 percent of the recommended dietary allowance of folate. Also known as vitamin B-9, folate is needed for healthy brain function and is important for maintaining overall mental and emotional health. It is needed to produce DNA and, as a B vitamin, helps with the breakdown and use of carbohydrates by your body. Alugbati is a good source of vitamin A, with 764 international units per 1 1/2-cup serving. This is over 100 percent of the recommended intake for women who are not pregnant or lactating, in which case it provides 59 to 99 percent of the recommended dietary allowance. A single serving provides 85 percent of the RDA for men. Vitamin A is needed for maintaining vision health and is also important for your immune system. Like regular spinach, alugbati is a vegetable rich in iron, with 0.98 milligram per 1 1/2-cup serving. This provides between 5.4 percent and 12 percent of the recommended dietary allowance of iron. Iron is an essential mineral as it helps your body make healthy red blood cells, which carry oxygen throughout your body. Alugbati is also rich in a number of antioxidants, namely lutein and talinum, according to a 2008 study published by the University of the Philippines at Los Banos. Antioxidants protect your body’s cells from potential damage that can be caused by free radicals and exposure to environmental toxins.